The past couple days we have all been watching the lake to see if we can guess “Ice Out” and also watching the snow melt looking forward to spring coming to Jackman. BIG HUGE FLUFFY SNOWFLAKES falling down along side the raindrops. I could not believe what I was seeing. It was a bit colder today but not SNOW on the last days of April! If we had our webcam actually running as a video you would be able to see the snow flakes better. They are HUGE…about the size of a half dollar. For now, if you look at the Webcam shots, you can see flecks of white. Also note that any ice left on the lake is now on our side of the lake. We did not get more ice, it just moved. The ice is truly about gone now. No more last minutes votes on Ice Out people. I think tomorrow is the day. 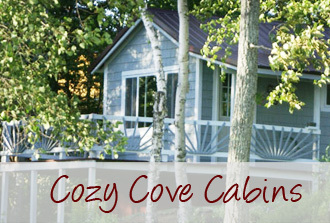 Win a FREE night at Cozy Cove Cabins! Now as we are getting closer to “ICE OUT” on Big Wood Lake and we have the WEBCAM facing the lake, here is an opportunity to stay free at our cabins. AND have a little fun 😉 trying to figure out the day the ice will go out. Send us an email or add a comment to this post with your guess as to the date the ice will go out. The exact date will be what the Town of Jackman records as the ice out date for 2008. Whomever wins that date, will win a one night stay for 2 (about a $65.00 value :)). You must submit your date before May 1st to be eligible. The latest it has gone out looks to be on May 19 in 1972. Now that the weather is getting warm again, I can sit out on the deck in the morning to have my first cup of Joe. The birds have been twitting about making nests and saying hello. On Monday morning, what a treat I had to hear the first sign of the loons arriving on Big Wood Lake. Off to the left, I heard them calling out 🙂 and it was wonderful to hear. The lake itself is still frozen although much of the shoreline in open so I guess that is enough open water for them make their nests. The Webcam we posted on our homepage has been a delight to many of our regulars as well as newbies to us and the region. Many have liked that they can see how much snow we have had or can monitor the melting of it. Some simply enjoyed catching one of our winter sunsets. We are really glad that it is doing for you what we wanted it to do. This week, we are going to move the camera so that the new “view” is overlooking Big Wood Lake. As we head toward “ice out”, we thought you all might enjoy catching the changes on the lake more than just looking at the snow melt on our driveway. :lol: That has to get a bit boring. We do not know if this will be it-s permanent home either as once the trees fill in, it may need to move again but until the snow melts, this is as close to the lake as we can be. At least you all should be able to see some great sunsets and watch “ice out” as it happens. SO if you find that there is no picture, well, the camera is in the process of being remounted elsewhere. Bear with us and “SEE” you soon! Our trails in the region have about a 3 foot base and then last night, we got about 6-8 inches more. This snow is heavy and will probably pack down easily.